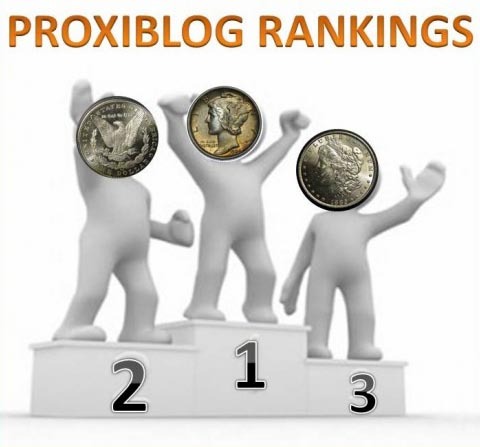 Western Auction and Weaver Signature Coin and Currency Auction top the rankings this month as competition continues to become intense on the Coins and Currency page of Proxibid. Western and Weaver continue to showcase premium consignments at frequent intervals with low buyer’s fees, sharp photography and inexpensive shipping. We are seeing more coin auctions meeting our Honor Roll standards or offering great buys with reduced premiums. Among the latter making continuous inroads in coins include Auction Unlimited and Southwest Bullion. Auction Unlimited also has a 10% online buyer’s fee, and Southwest Bullion has the lowest on the portal at ZERO percent. New to the rankings and scoring in the top 10 on first try are Liberty Shops, an up-and-coming numismatic house with 8% online BP, numismatic lot descriptions and reasonable shipping. Back to the Past Collectibles features another low BP at 10% with good photos, accurate lot descriptions and $5 flat rate shipping–no matter how many lots won. We anticipate more companies signing on with Proxibid with these sell-through standards. We Care Downsizing makes its first appearance on our list. The house doesn’t specialize in coins, but always features a few choice lots–again, meeting Honor Roll standards. Jewelry Exchange also re-enters the list with regular consignments of high quality coins, 15% BP and great customer service. Leonard Auction, Midwest Coins and Matthew Bullock Auctioneers moved up in the rankings. Other coin-selling houses, including old Proxibid standbys, are advised to enhance their lot descriptions and photography, do flat-rate shipping, and lower online BP with an occasional special to bring bidders to your sessions. We also take this opportunity to thank our scholarship sponsors who donate funds for the next generation of auction bidders. To read why this is important, see this article. This entry was posted in Best Practices, Featured Updates, News. Bookmark the permalink.